DuBois ABC Seamless offers exceptional steel siding products for homeowners in and near Minneapolis, Minnesota. We have faithfully served area homeowners since 1980, manufacturing and installing top-quality seamless steel siding that offers extraordinary beauty and protection for their homes. We have been recognized as one of Qualified Remodeler magazine’s Top 500 remodeling companies in the country numerous times and have also been listed among their 200 Big Home Improvement Companies. Homeowners in the Twin Cities know that DuBois ABC Seamless is the company to trust for all of their siding needs. Our siding is manufactured using heavy-gauge, hot-dipped, G-90 galvanized steel, which is thicker and stronger than any other exterior remodeling material on the market today. It’s strong enough to withstand impacts from wind-blown debris and hail, and because it’s non-combustible, it provides an extra level of protection against fire damage. Atop the raw steel core, we add eight layers of protective coating that resists cracking, peeling, chipping, fading, and other damage that can result from years of exposure to sunlight and harsh weather, which could otherwise mar your home’s appearance and make it look old and run down. 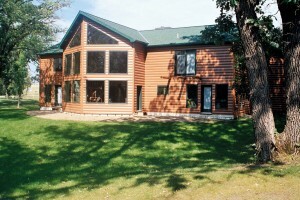 We custom-manufacture your new house siding onsite, creating each panel to match the precise dimensions of your home. This eliminates unsightly seams, which can improve your home’s energy efficiency by reducing heat transfer. We literally wrap your home with premium insulation and top it off with seamless steel, making it easier to maintain a comfortable temperature inside your home year-round. Contact DuBois ABC Seamless today to see our amazing siding products, including the astounding array of colors and styles we have available. Discover for yourself why so many homeowners in Minneapolis, MN, and throughout the Twin Cities region have chosen us to be their trusted home improvement contractor and have opted to protect their homes with ABC Seamless steel siding.